Fluidall’s Portable Liquid Storage Tanks are complete mobile solutions to transport your oil, DEF, hydraulic fluids and other industrial fluids to remote service areas, whether in-shop or in-field. We offer many configurations for all of your liquid storage and handling challenges. Many of our portable liquid storage tanks are designed on forklift skids for off-road servicing and dispensing, and up to three tanks can be stacked on our mobile multi-lube skid, which is also configurable with casters for in-shop applications. Fluidall’s simple one fluid storage and dispensing tanks include our gravity fed tanks on steel forklift bases or poly forklift pallets. However, all of our portable liquid storage tanks can be equipped with pumps and hose reels to conveniently dispense oils and other liquids to remote areas. Mobile tank solutions can also be designed with on-board filtration to ensure that fluid cleanliness targets are achieved before dispensing. Single and multiple fluids can also be utilized in our castered storage and dispensing systems. These portable liquid storage tanks are extremely flexible to move fluids throughout shops. Simply roll the system to the service area, attach air or electrical connections, and service multiple bays at ease. 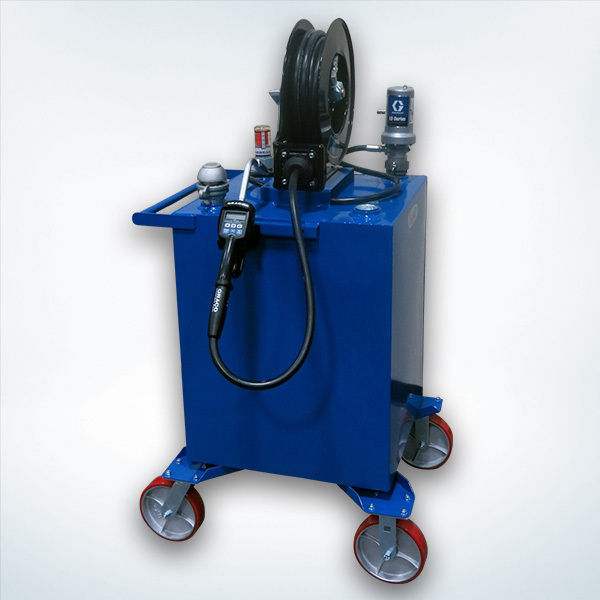 Our single fluid oil tank with casters is a high demand system for it’s simple design equipped with a high performance dispense package. In general, Fluidall offers poly liquid storage tanks with capacities from 25 to 330 gallons, which are all configurable into multi-fluid portable tank systems. Larger capacities, from 110 to 400 gallons include our double wall tanks with portable cages. Specific liquids such as DEF and Diesel can be stored and dispensed from our portable DEF/Diesel tanks with pumping equipment, already packaged and shipped pre-assembled. Contact Fluidall with your requirements for portable multi-fluid storage and we’ll configure a portable system with the equipment that meets your needs.